Win! A Place on the River Cottage HQ Beer, Cider and Spirits Course! This is on the two thirsty gardener’s website! They also have printable labels for your home made booze! 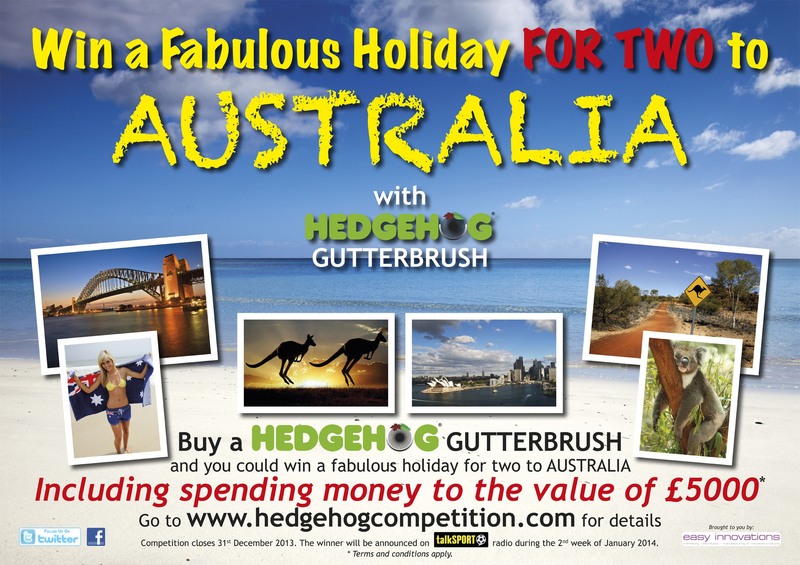 Hedgehog Gutter Brush has launched a competition to win a fantastic holiday for two to Australia including air fares, accommodation and spending money worth up to £5,000. Hedgehog Gutter Brush is a simple yet effective device that helps protect and maintain gutters by preventing leaves, twigs and other debris from entering the gutter – while allowing rainfall to flow freely through them. The competition has been launched to highlight the importance of preparing and protecting your property for the onset of autumn and winter when blocked gutters and drains can result in expensive fees if professionals are required to clear them. Hedgehog is manufactured from hard wearing UV resistant polypropylene brush filaments spun around a steel wire spine. It’s virtually indestructible, requires no maintenance and will keep gutters clear year-on-year. The clever device automatically adapts to the shape of almost any type of gutter, fits around corners and over down pipe outlets and can be simply and quickly fitted in just minutes – without the need for specialist installation. Hedgehog Gutter Brush retails at just £14.99 for a standard 4mtr x 100mm brush and is available in black, brown or white. The product comes with a 10 year guarantee and is available from most good Builders Merchants and DIY outlets nationwide. The winner will be drawn at random and announced on talkSPORT Radio in January 2014. Win a ride on mower worth nearly £2ooo!! Enter now for your chance to win a MTD 420cc Ride-on Lawn Mower worth £1999.99. Achieve the perfect lawn this spring and give everyone something to talk about. All you have to do is sign up to our newsletters below and you will automatically be entered into our free prize draw. What’s stopping you, sign up now at the range! A competition for a garden design! This is a competition to design a family-friendly garden, based on an 8m x 8m flat site, which may be viewed by visitors from 2 or 3 sides. A backdrop should be considered. It may include an area of excavation but it should be no deeper than 0.5m. The competition is not open to professional garden designers or gardeners – only amateurs. To qualify as an amateur, individuals should not earn more than 50% of their annual income from garden design and/or gardening and should not hold a formal garden design qualification. There’s a list of things you’re not allowed and a list of plants you can use! I’m quite tempted although I have never tried anything like this before! Got photos of your garden? 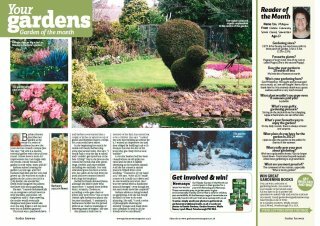 getinvolved.gardenanswers@bauermedia.co.uk or post them to us at Reader Gardens, Garden Answers, Media House, Lynch Wood, Peterborough, PE2 6EA. All those published will receive one years worth of natural, environmentally friendly pest control products from Nemasys! This competition closes at 23.59 on 13.11.11. Entry is free, and prizes will include a year’s membership of both the Royal Horticultural Society, and your local Wildlife Trust, plus attendance at a wildlife gardening masterclass at the Hampton Court Flower Show. 200 words maximum and 2-6 photos needed. The deadline is 20 May 2012.
you do to improve it that will make a difference to wildlife. Any school, college or nursery garden managed with wildlife in mind can enter. a place of worship or for a prison? If so then this category is for you. could you create a new one? If so, this category will be for you.